An enchanting small romantic castle surrounded by a circular Grade II listed bailey in a unique location surrounded by open countryside. A comfortable home-from-home, elegantly furnished throughout, designed with your comfort and relaxation in mind, beautifully done with great attention to detail. Beautiful 35′ reception room with ornate panelled ceiling and turrets to the corners. A wonderfully private castellated roof terrace gives wonderful 360 degree views across the surrounding countryside. An unusual holiday hideaway perfect for families and groups of friends at any time of the year, with secure gated entry and ample parking. 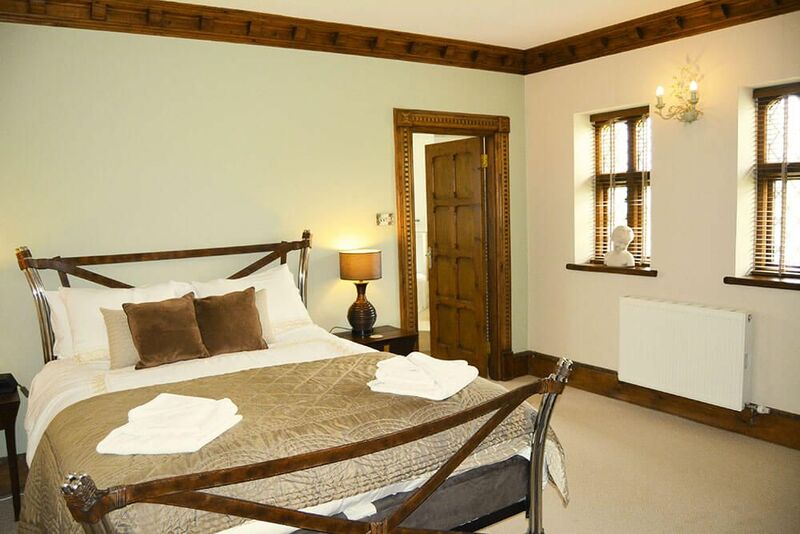 Short and mid week breaks are available, with a minimum stay of three nights. 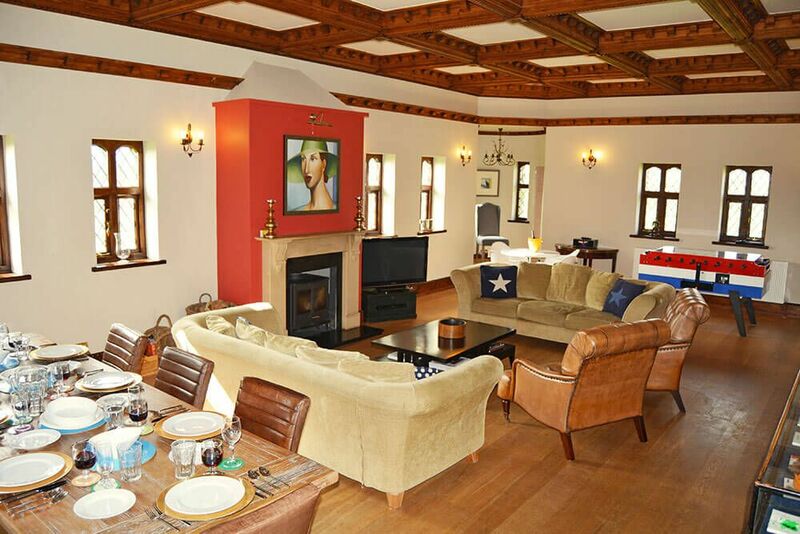 The ideal setting for Autumn and Winter breaks, a New Year gathering or Christmas morning with central heating, a cosy open fire and very comfortable beds. There are some excellent walks in the area including fabulous walks from the front door. A perfect central base for exploring North Devon. 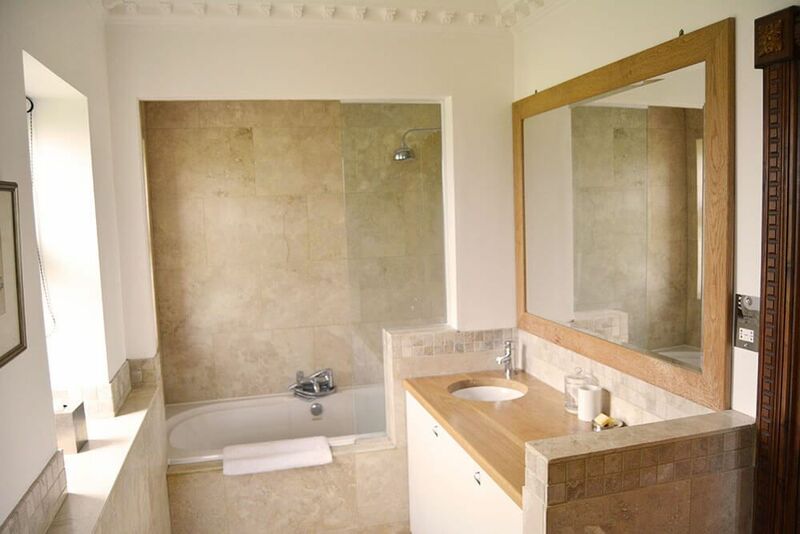 Close to quaint villages, seaside towns, exceptional gardens and historic houses. 35′ reception room with ornate panelled ceiling and turrets to the corners, an open fire, 42″ TV and dining area with seating for eight guests. 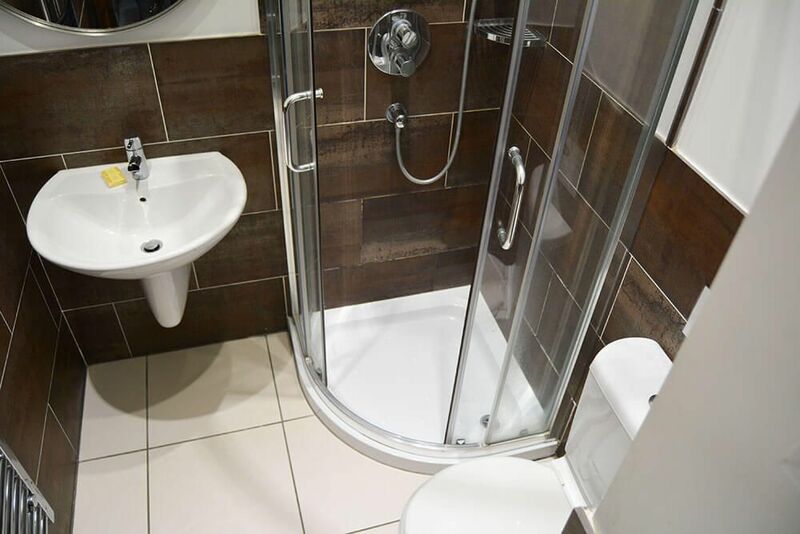 Double bedroom with 5′ bed and an en suite bathroom with shower over the bath. 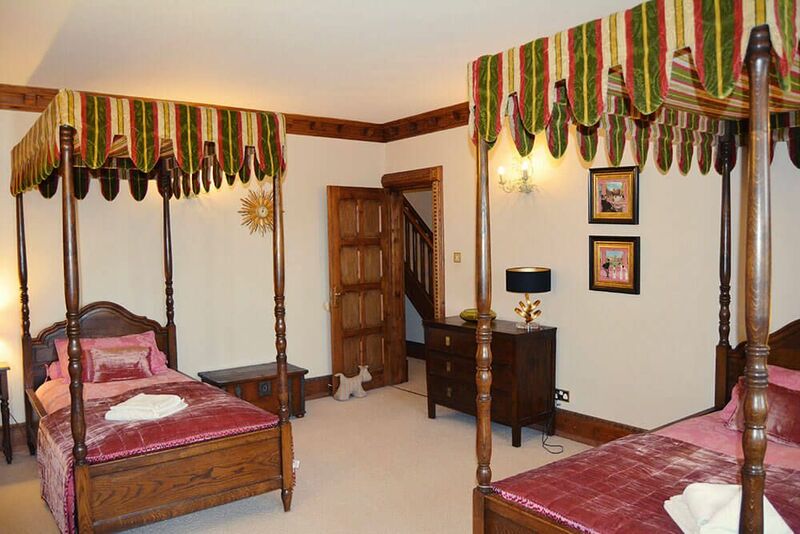 Twin bedroom with four poster 3′ beds and an en suite bathroom with shower over the bath. 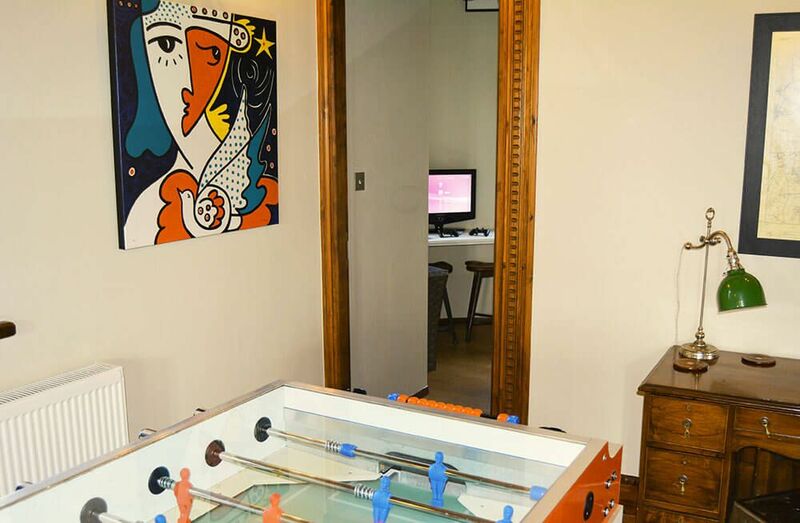 Circular double bedroom with 4’6″ bed and access to the roof terrace. Circular twin bedroom with 3′ beds. Access to tower lookout with 360 degree views. 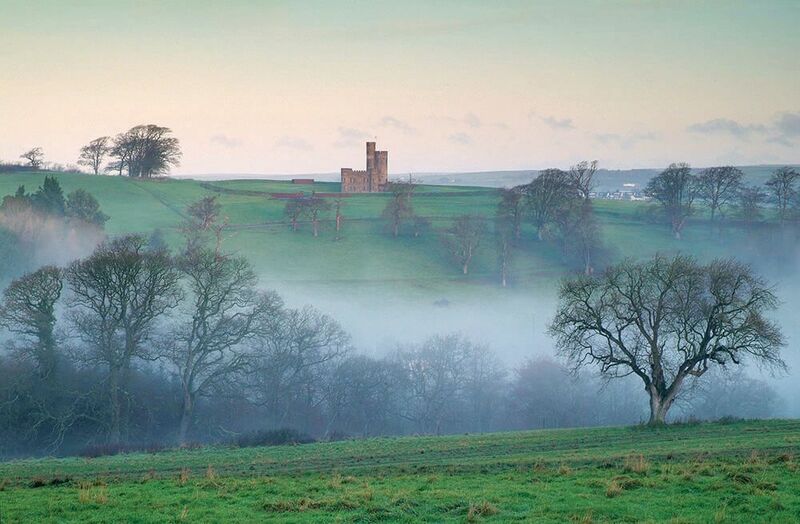 Tawstock Castle is no ordinary home. 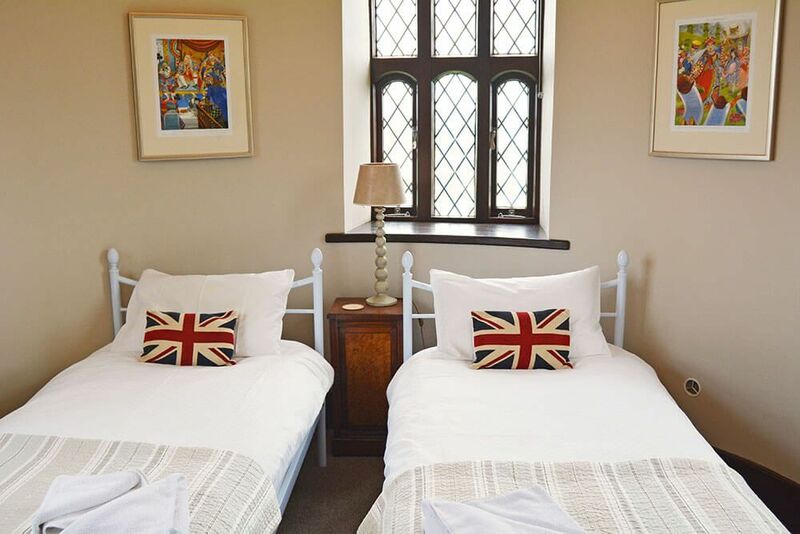 It is an enchanting small romantic castle sleeping 8 near the the quiet picturesque village of Tawstock, close to North Devon’s sandy beaches. 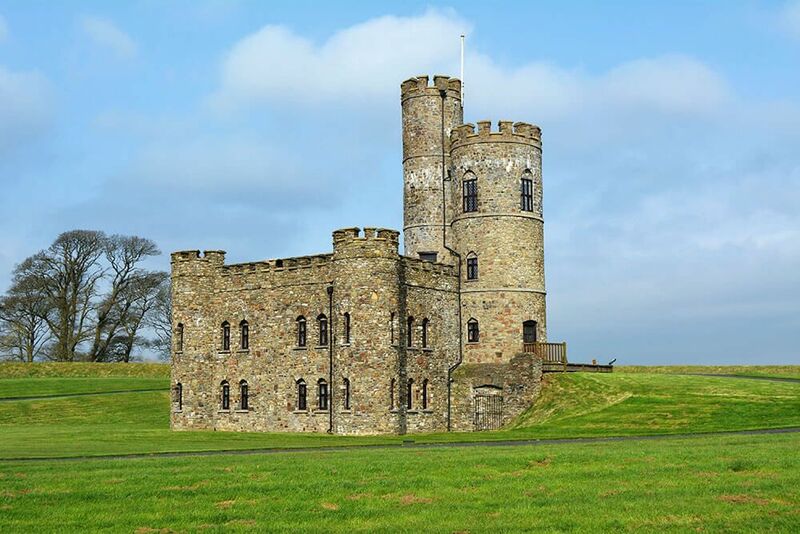 Surrounded by a circular Grade II listed bailey (walled courtyard), the stunning 18th-century castle has the ‘wow’ factor and a fascinating history. 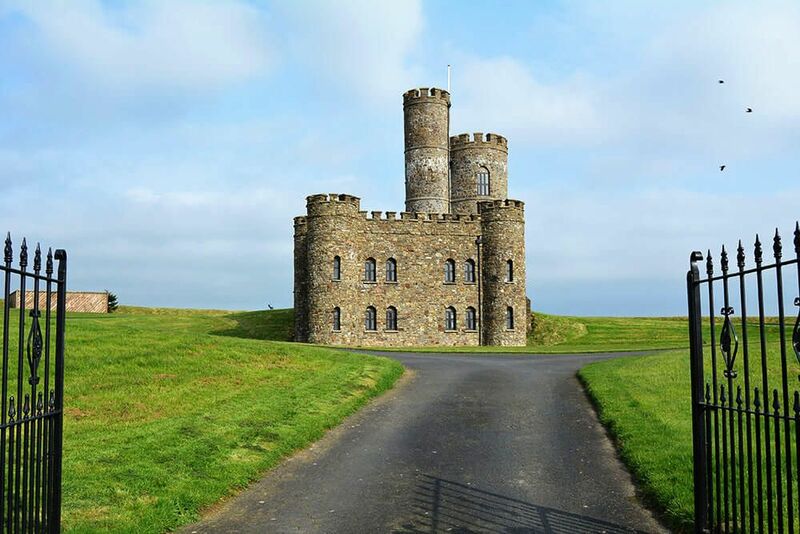 It is the last castle to have built in England and has two Grade II listed towers which were originally constructed as a lookout for Lord Wrey. 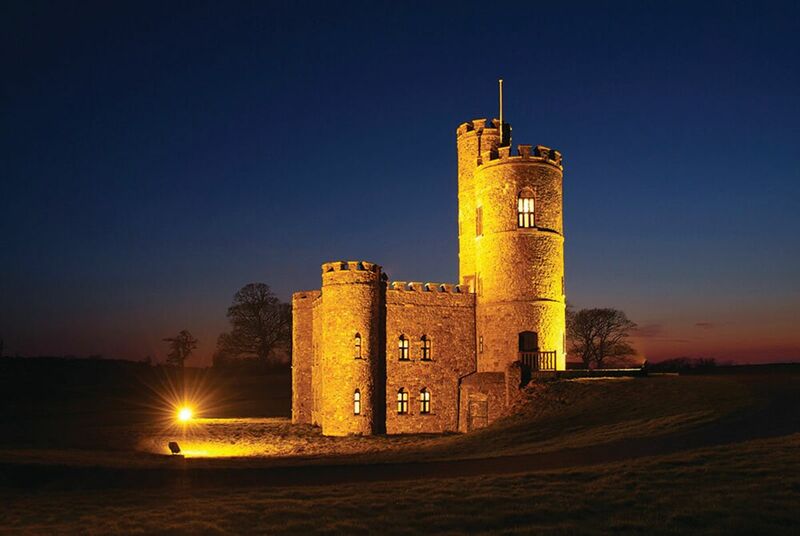 With its fairytale turrets and yawning acreage of perfect parkland, Tawstock Castle majestically presides over Devonshire countryside with unique 360 degree views over the Taw Valley and Saunton Sands. 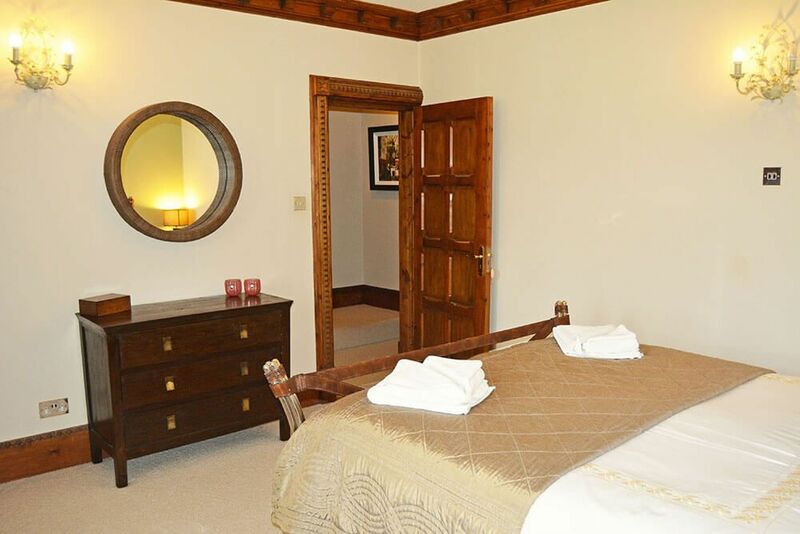 A tranquil warm and welcoming hideaway deep within the Devon dream. 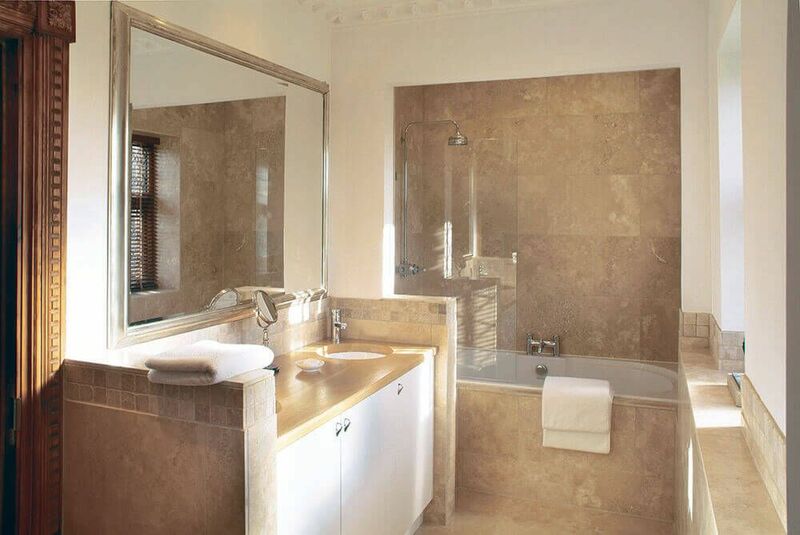 Beautifully restored and effortlessly elegant, the owner’s attention to detail is evident throughout with lots of thoughtful touches to make your stay special. 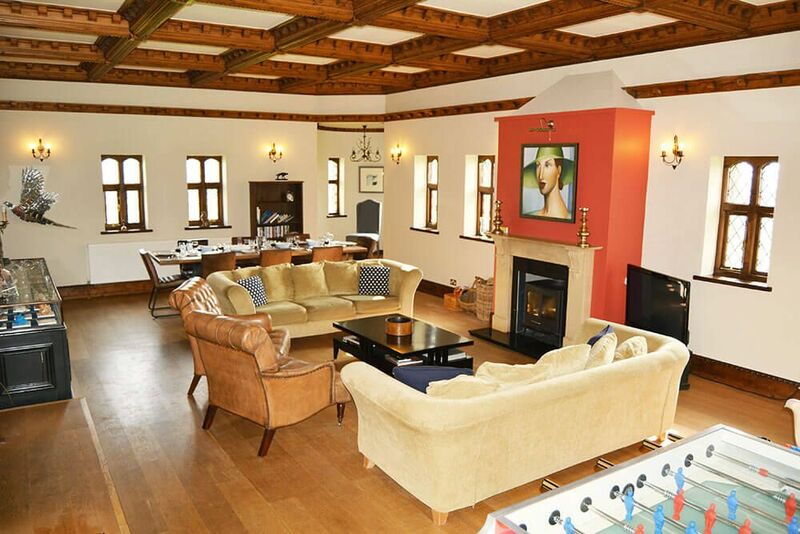 On the ground floor a 35′ reception room with ornate panelled ceiling and turrets to the corners is a very sociable space, boasting luxurious sofas, a cosy laid open fire, 42″ TV and dining area with seating for eight. 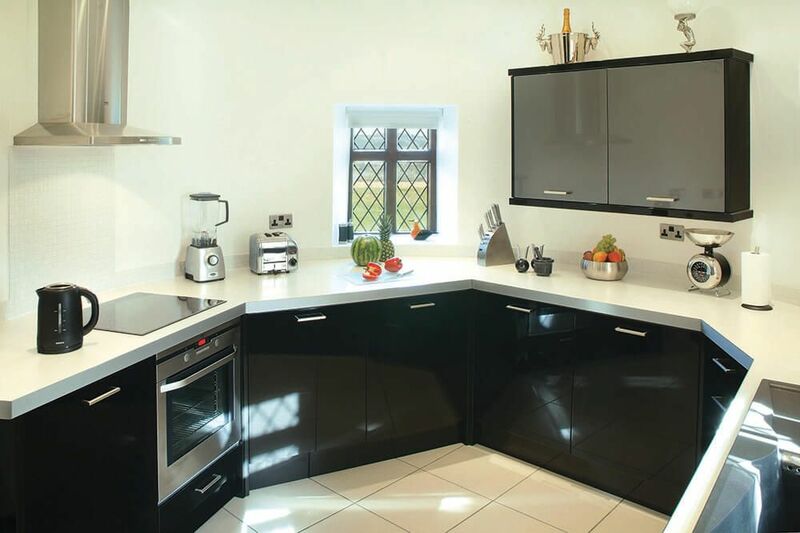 The unique circular kitchen is contemporary and very well equipped. 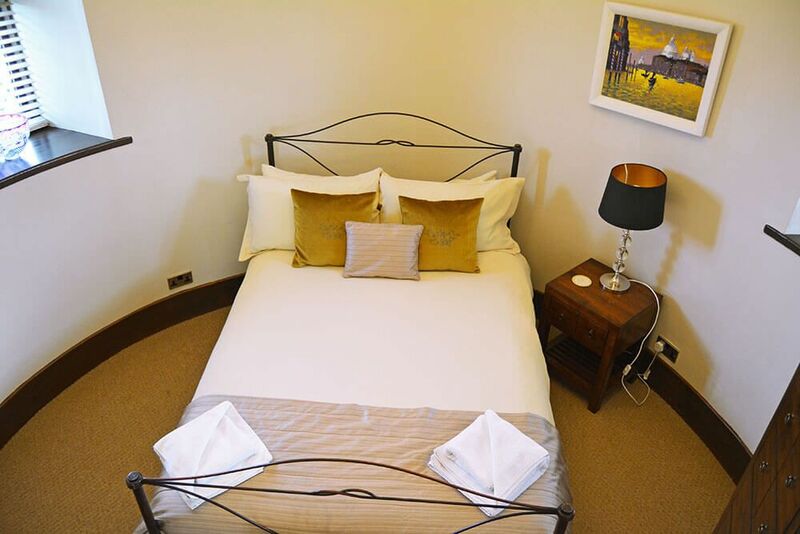 The four sumptuous bedrooms have incredibly comfortable beds and two bedrooms have the added benefit of en suite facilities. Two circular bedrooms are in the tower itself with access to a wonderfully private castellated roof terrace with 360 degree views. Approached through electric gates, Tawstock Castle is surrounded by approximately one acre of lawned gardens enclosed by the bailey. The ideal spot to sizzle steaks on the barbie or relax with a spot of afternoon tea or a glass or two of bubbly. 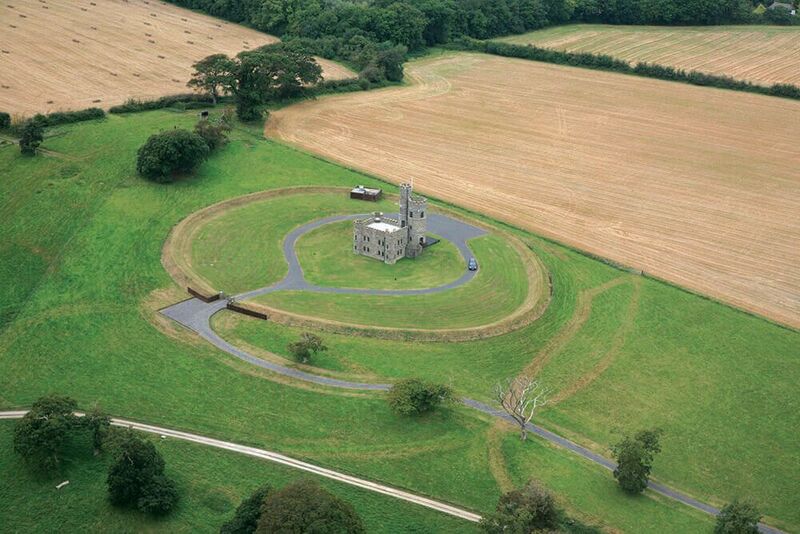 One of the castle’s biggest pulls is its wonderful isolation, perched on a rounded hill top in open countryside and wonderful surroundings. Enjoy fabulous rural walks from the doorstep; the stunning River Taw valley is lined with thick woods where you can enjoy sheltered walks on one of the many footpaths. The South West Coastal Path and the famous Tarka Trail are close by – a must for cyclists and walkers. 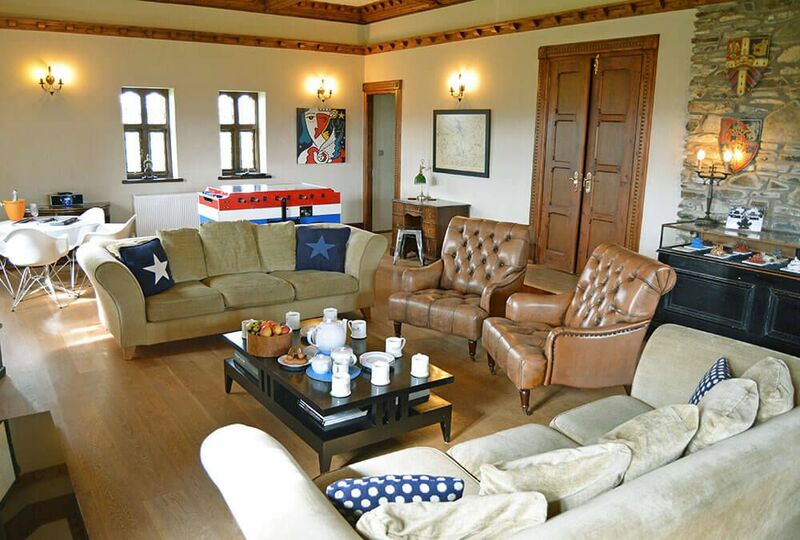 Tawstock Castle is conveniently close to all the facilities of the market town of Barnstaple two miles away. This busy traditional Devon coastal town has an interesting pannier market, shops, restaurants and bars, along with two fabulous sandy beaches, which are popular with surfers and families. The town is renowned for its floral displays for which it has won a gold award for the prettiest floral town in Europe. 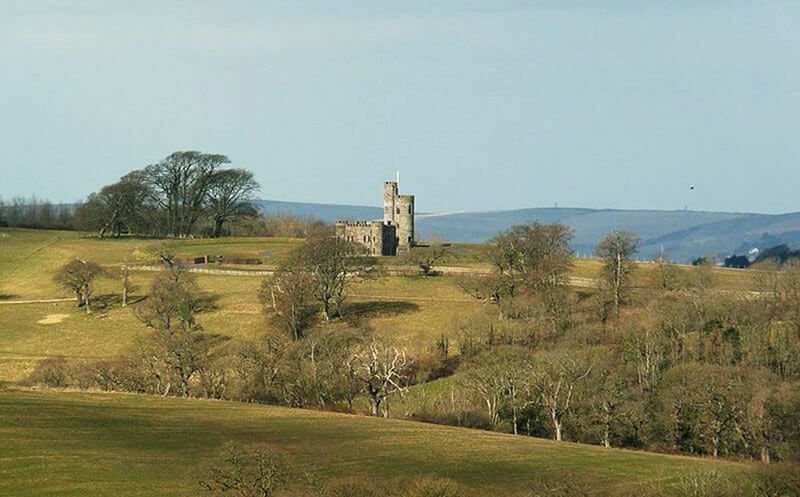 Set in an incredible location, Tawstock Castle is central to just about every attraction in the area! Barnstaple lies at the end of the magnificent Tarka Line railway, which takes you through spectacular North Devon countryside with wooded river valleys, rugged moorland and a stretch of coastline. Along the coast, the villages of Appledore and Clovelly are postcard-perfect English seaside villages. Other great attractions include boat trips to the mystic Lundy Island from Ifracome Pier or Bideford Quay, Watermouth Castle and Family Theme Park, the Lynton and Lynmouth Cliff Railway, and the unusual Cobbaton Combat Collection of military vehicles. 2018-02-12 Mark Simpkin, UK "Great place not to be missed. Thank you we had a great time. Mum just loved it as we hoped." We had the most amazing time at Tawstock. My wife absolutely loved it. Here is a little video I took which hopefully shows how amazing it was. North Devon beaches are well known around the world for their clean water, golden sands and excellent waves. 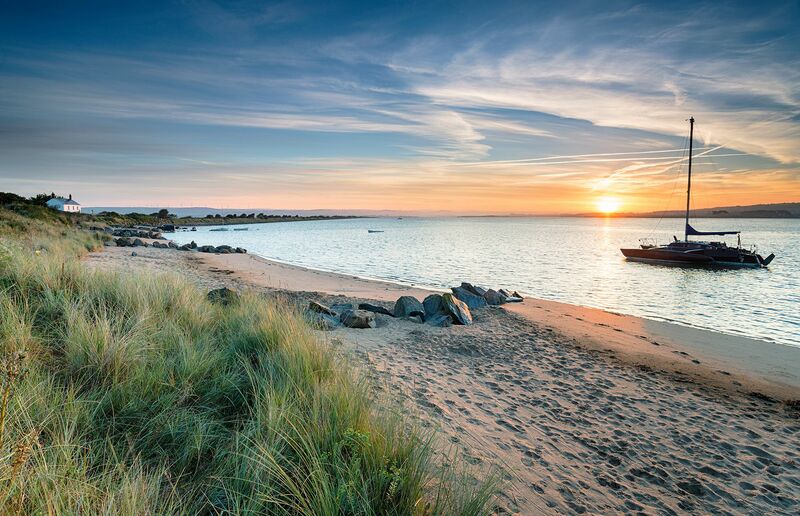 Saunton, Croyde and Woolacombe, three of the most beautiful beaches to found in the UK are within half an hour’s drive and Instow Sands is just seven miles from the Castle. All these beaches are located in an Area of Outstanding Natural Beauty and are situated along the South West Coast Path. Instow (7 miles) beach and pretty village, home of the Royal North Devon Yacht Club. Saunton Sands (9.5 miles). Saunton is an ideal surfing beach for beginners, providing a more smooth ride. Westward Ho! (11 miles) has a gorgeous beach, which is popular for surfing and swimming. The clean sands are protected by a large pebble ridge and grasslands, which lie within an Area of Outstanding Natural Beauty. Croyde Bay (11 miles) has one of the best beach breaks in the UK and therefore attracts the more experienced surfers. Woolacombe (15.5 miles). Putsborough, located in the southern corner of Woolacombe, will tend to have clean surf when nowhere else does, due to the high cliffs protecting it from the gales. Broomhill Sculpture Garden, Barnstaple (2 miles). Surrounded by woodland and streams, the garden features a number of international and local sculpture projects, as well as an excellent restaurant. RHS Garden Rosemoor, Great Torrington (11 miles). Marwood Hill Gardens, Marwood, Barnstaple (6 miles). Tapeley Park Stately Home and Gardens, Westleigh, Bideford (8 miles). Castle Hill Gardens, Torrington (10.4 miles). Docton Mill Gardens, Hartland, Bideford (25 miles). Arlington Court and the National Trust Carriage Museum (National Trust), Arlington, near Barnstaple (11 miles). The Regency house holds an impressive collection of horse drawn vehicles and beautiful gardens. Arlington has over 20 miles of footpaths, trailing around lakes and bridges. Hartland Abbey & Gardens, Hartland, Bideford (24.5 miles). Please check the web site for events throughout the year. BARNSTAPLE (2 miles) is a lively traditional coastal town with a pannier market, shops, restaurants and bars, along with two fabulous sandy beaches, which are popular with surfers and families. Barnstaple is also home to a multi-screen cinema, the Queen’s Theatre, leisure and tennis centre and a bowling alley. The town is renowned for its floral displays having won a Britain in Bloom award and flowers are found around every corner of the town in the most unusual places. Barnstaple lies at the end of the magnificent The Tarka Line railway, which takes you through the spectacular North Devon countryside of wooded river valleys, rugged moorland and a stretch of coastline. INSTOW (7 miles) stands where the rivers Torridge and Taw run from the moors into Bideford Bay and has a quiet charm and beach. BIDEFORD (10.5 miles) is a quaint town with various shops, restaurants and galleries. Running alongside the river, the town has a lovely country feel. Attractions include the quirky shops, pannier market and the Tarka Trail pedestrian and cycle way. Take a boat trip to Lundy Island, a unique and unspoilt island, undisturbed by cars, and home to a fascinating array of wildlife amidst dramatic scenery: deer, seals, ponies, dolphins and rare birds. On the edge of Bideford is the Atlantic Village, a large shopping outlet housing more than 30 retailers and an adventure park for children. The Big Sheep is an amusement farm park located in Abbotsham, near Bideford (11 miles). Please check the web site for events throughout the year. 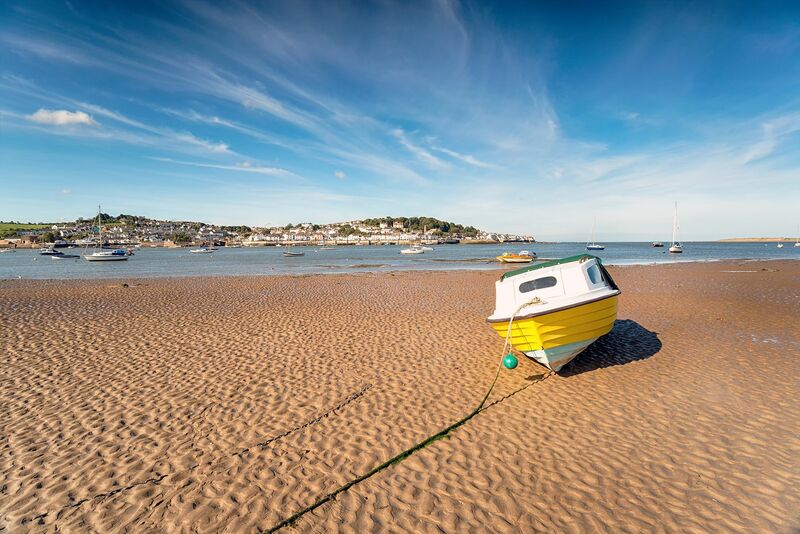 APPLEDORE (11.5 miles) is a quaint fishing village whose only connection to the mainland is a wonderful peninsular surrounded by salt marshes, which are part of a world biosphere site, and a stunning coastline. Home to shipbuilders and Hocking’s ice cream, which is only sold in North Devon, there are Ferry links to Instow. Attractions include the The North Devon Maritime Museum & Victorian Schoolroom. ILFRACOMBE (13 miles) is a beautiful Victorian seaside town, home to artist Damien Hirst and his statue ‘Verity,’ which stands proudly above the pretty harbour. Fresh seafood can be enjoyed in several of the restaurants and tea rooms, and there are lovely galleries and shops to peruse. Attractions include Ilfracombe Aquarium. From Ilfracombe Pier you can set sail for Lundy Island. Tunnels Beaches, are a network of beautiful sheltered beaches and tidal Victorian bathing pool accessed via four tunnels hand carved in the 1820’s. Located alongside the blue flag beach is a café and soft play centre. CLOVELLY (21 miles) is set into a steep hillside that drops more than 400ft down to Clovelly Pier. One of the most famous villages in the world, the car-free cobbled streets have made it a wonderful place for visitors to walk. Home to a cluster of shops, café and public house, attractions include Hobby Drive Walk and Clovelly Court Gardens. 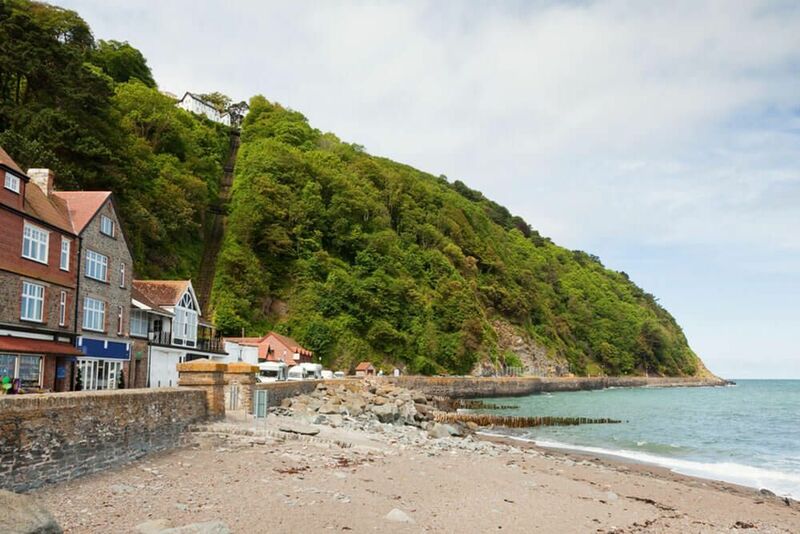 LYNTON & LYNMOUTH (21 miles) in the Exmoor National Park are connected by a fascinating Cliff Railway, with fabulous walks to Watersmeet and the stunning coastline at The Valley of the Rocks. HARTLAND (23 miles) is a lovely village steeped in history and excellent for capturing breath taking photos. 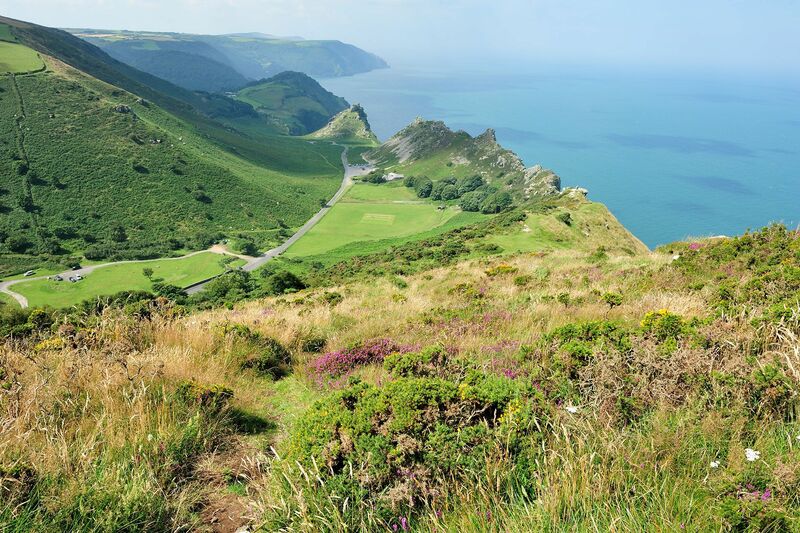 If the beach doesn’t take your fancy, a 30-minute drive from Tawstock Castle will take you well up onto the spectacular countryside of Exmoor National Park, to open isolated moorland or to some of its pretty villages, both being ideal bases for the many recognised walks which Exmoor offers. 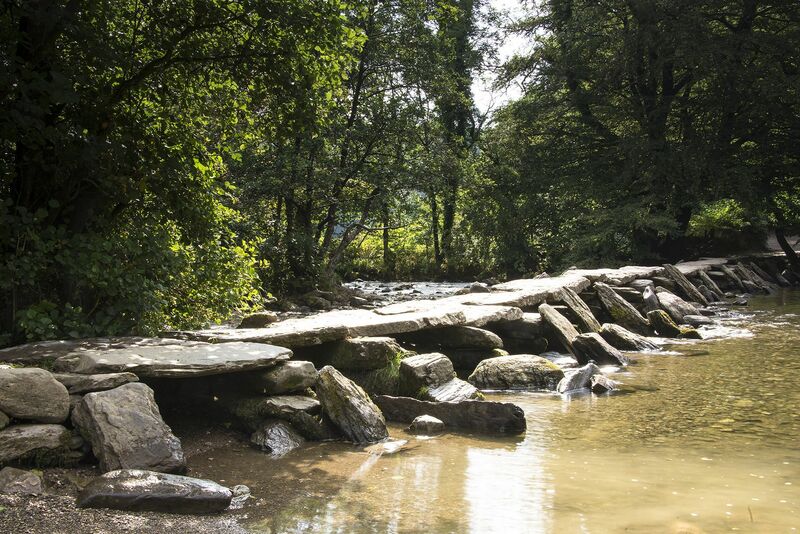 Tarr Steps, Landacre Bridge and Dunkery Beacon are just a few of the beauty spots well worth visiting on Exmoor, as well as the villages of Exford and Winsford. Travel the Cliff Railway between the two villages of Lynton and Lynmouth, enjoy the stunning coastline at The Valley of the Rocks, or walk up to Watersmeet and enjoy a cream tea. St Peter’s Church in Tawstock has some of the finest monuments in Devon. Dating back to the 14th century the church is cruciform in shape with a central tower. Cobbaton Combat Collection of military vehicles, Cobbaton, Chittlehampton (5.8 miles). Dartington Crystal, Great Torrington (10 miles). The Big Sheep is an amusement farm park located in Abbotsham, near Bideford (11 miles). Exmoor Zoo, Bratton Fleming (12.5 miles). Watermouth Castle and Family Theme Park, Berrynarbor, near Ilfracombe (14 miles). The Milky Way Adventure Park, Clovelly (18.5 miles). 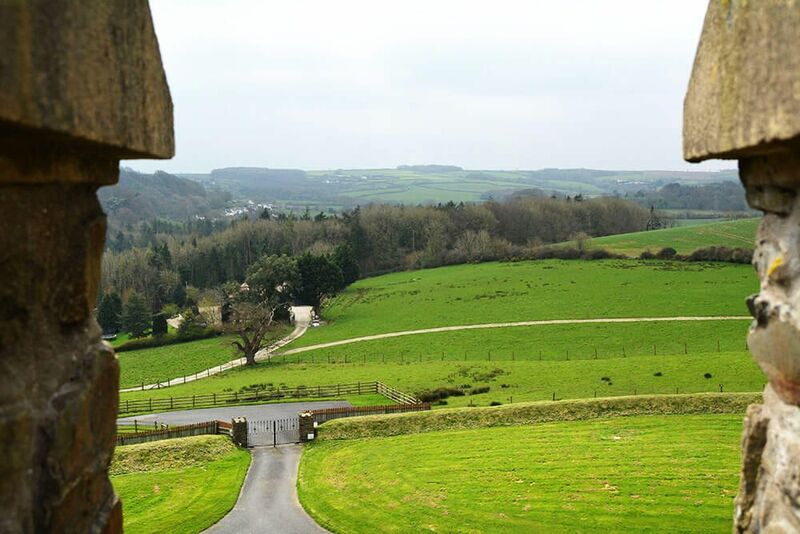 The area surrounding Tawstock is perfect for walking and cycling with the Tarka Trail less than a mile away. The Tarka Trail is the former Barnstaple to Bideford railway line, one of the country’s longest continuous traffic-free walking and cycling paths, and forms part of the Devon Coast to Coast Cycle Route. 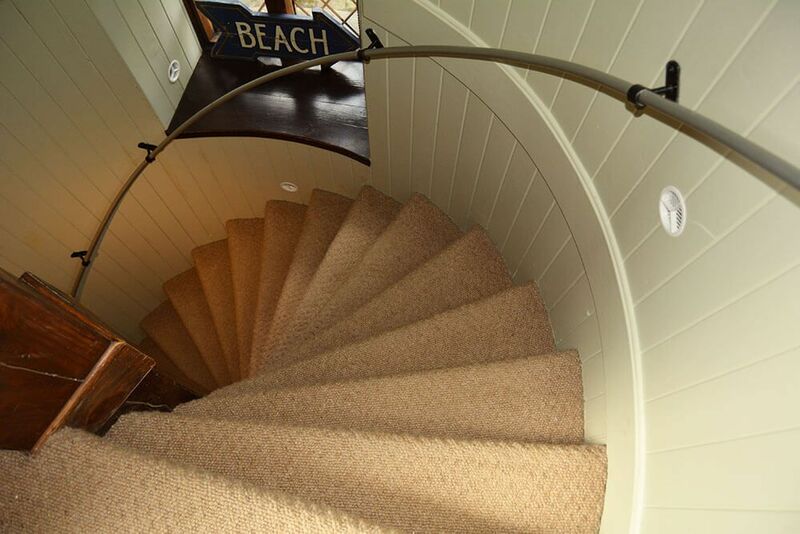 Providing excellent views of the Taw estuary the route is relatively level and ideal for families with young children. The South West Coast Path runs the entire length of the coastline and takes walkers to some of the most beautiful locations. This stunning pathway is well looked after and moves through Sites of Special Scientific Interest and Areas of Outstanding Natural Beauty. Whether you are looking for a casual stroll or more energetic trek, the South West Coast Path has something to offer. 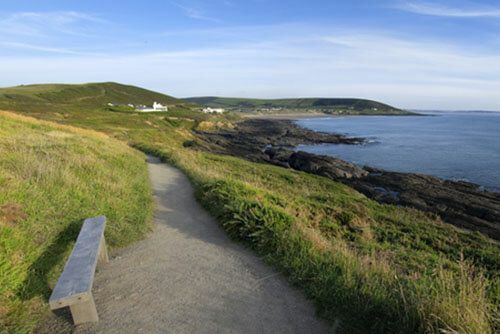 Click here to download and print a large variety of suggested walks in the area, including a lovely coastal walk from Croyde along to Baggy Point, with the option to continue round to Woolacombe. Braunton Marsh and Great Field Country Park (7 miles). Northam Burrows Country Park & Burrows Centre SSSI (11.5 miles). The area surrounding Tawstock is perfect for golf, horse riding, watersports, quad biking, fishing and clay pigeon shooting which can all be enjoyed locally. Test your golfing skills at one of the many great golf courses in the area with seven excellent courses on which to tee off. Portmore Golf Park, Barnstaple (5 miles). Saunton Golf Club, Braunton (9 miles). Royal North Devon Golf Club, Westward Ho!, Bideford (10 miles) dates back to 1864 and is the oldest course in the country. Ilfracombe Golf Club (14.7 miles). North Devon Equestrian Centre, Shirwell, Barnstaple (8.8 miles). Roylands Riding Stables, Moor Lane, Croyde, Braunton (12 miles). Woolacombe Riding Stables, Eastacott Farm, Woolacombe (12.7 miles). Dean Riding Stables, Lower Dean Farm, Dean, Parracombe (13.7 miles). Ride out on a quiet or adventurous hack around Exmoor. Bold Try Riding Stables, Leigh Road, Chulmleigh (16 miles). Brendon Manor Riding Stables, Brendon Manor Farm, Brendon Manor, Lynton (22.6 miles). Ideal if you want to go horse riding over Exmoor. North Devon Surf School, Westward Ho! (11 miles). The Ultimate Adventure Centre, near Bideford (11 miles). Independent Charters, Clovelly (21 miles). Keypitts Stables ‘n’ Quads, Ilfracombe (12 miles). North Devon & Exmoor Walking Festival. Seaweed Festival, Clovelly (21 miles). Ilfracombe Victorian Celebration, Ilfracombe (14 miles). GoldCoast Oceanfest, Croyde (11.5 miles). Clovelly Gig Regatta, Clovelly (21 miles). Clovelly Maritime Festival, Clovelly (21 miles). Woolsery Agricultural Show, Clovelly (21 miles). North Devon Show, South Molton (14 miles). Clovelly Lifeboat Weekend, Clovelly (21 miles). National Sandcastle Competition, Croyde Beach (12 miles). Sea Ilfracombe Festival, Ilfracombe (14 miles). Lobster and Crab Feast, Clovelly (21 miles). Barnstaple Carnival, Barnstaple (2 miles). The Appledore Book Festival, Appledore (11.5 miles). North Devon Foodfest, Barnstaple Pannier Market (2 miles). Clovelly Herring Festival, Clovelly (21 miles). Christmas Lights, Clovelly (21 miles).